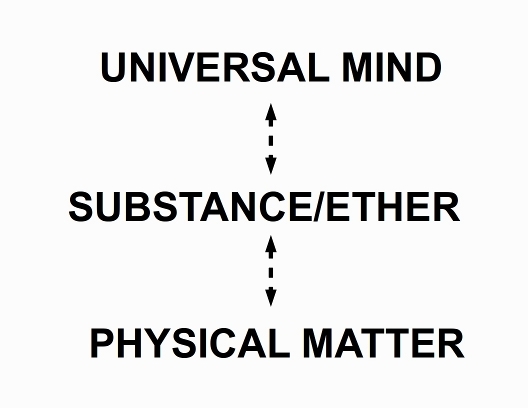 Universal Mind. All-Originating Spirit. First Cause. Principle of Life. GOD. These and many other names or titles have been put forth by religion and philosophy to define and describe that Original Power which, according to their various tenets, lies behind and at the back of the creation and sustaining of all that exists. Going further, it can be demonstrated that the idea of an Original Power is not a mere theological invention. Rather, is the logical and scientific conclusion reached by every philosophical or religious system which has ever sought to arrive at a sensible answer to an all-important question. That question being: How did Life originate? So-to-say, working backwards from physical matter, as we commonly know it, we "regress" through molecules, atoms, "quarks" or various sub-atomic particles, until (philosophically) we arrive at the Original Substance (also referred to as Ether). In answer to the question: "How did the Original Substance come into being? ", a little consideration would reveal that Substance did not and could not have come into being, on its own account. Rather, it had its origin in something that, as another put it, though it works in and through the particles of which Substance is ultimately composed, is not those particles themselves. It is this something that is otherwise referred to as the Original Power. Now, further consideration will leave virtually no room for doubt that such an Original Power must be both Infinite and Eternal. Being Infinite or limitless implies that it is inexhaustible. If it was not so, then if the moment ever came when said Power was exhausted, at that moment, nothing else could ever come into existence, but it would also mean the beginning of the end for all that currently exists. Likewise, if this Original Power was not Eternal, then what was it that brought it into being, if nothing existed before it? And again, if it was not Eternal, it would sooner or later be exhausted. The reader is free to investigate for themself, but they will likely arrive at the same conclusion - that the only postulation of this Original Power which, so-to-say, "makes sense", is that it is both Infinite and Eternal. Another interesting point which arises out of the preceding is that, because this Original Power - which, for brevity, will be referred to here most often as either Universal Mind or Spirit - is both Infinite and Eternal, it is a logical inference that Universal Mind exists - or to be more precise, subsists - independently of Time and Space. Space may be defined as the boundless, three-dimensional extent in which physical objects exist and physical events occur, and have relative position and direction. Similarly, Time may be defined as the period occupied by a body, in passing from one given point in space to another - it should be noted that this is merely one of many definitions. But if Universal Mind is infinite or limitless, it is therefore equally present in its entirety, at any and every point of space. Thus, from the definition of Space previously stated, there is no extent or boundary to define or limit the existence of Universal Mind - if some boundary or extent existed, then it could no longer be classified as Universal or Infinite. And since by the preceding postulation, Universal Mind occupies all space, there is no sequence in time to measure any movement of Universal Mind from one point of space to another, because, as stated previously, it exists in its entirety, at every point of space, at any moment in time. This is not at all to imply that Time and Space do not really exist. On the contrary, Time and Space may be considered the primary governing factors which exist - or again, subsist - in a certain plane of being. That particular plane of being has been defined by many names - the plane of the Relative, of the Conditioned, or of the Concrete. 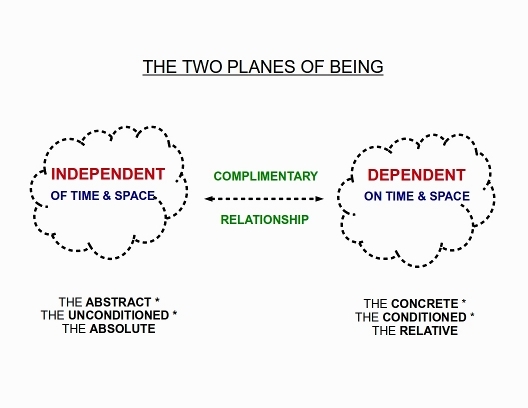 Also, this plane does not exist as an independent entity - it exists as a compliment or polar opposite to another plane of being - one which is independent of Time and Space. That other plane of being is often referred to as the plane of the Absolute, of the Un-conditioned, or of the Abstract. It should be emphasized that the relation between these planes of being is not one of direct opposition, but one of polar opposition - in the same way that an electric battery must have both a positive and a negative terminal, or a magnet must have both a north and a south pole. Or in even simpler terms, a box must have both an inside as well as an outside, if it is to exist as a box. The preceding are examples of the existence and providence of a universal principle referred to as the Law of Polarity, which, in summary, states that everything has a polar opposite. The preceding also leads to a point, which was first raised in the discourse on "Mind Power", that the inquirer would do well to grasp sooner, rather than later. From that previous discussion, it may be recalled, that the Original Power - call it Universal Mind, Spirit, GOD, or any other name (of which there are many) - has been defined as the Principle (or Source) of that which may be called Life - or, as it has been expressed by various writers and teachers, it is Life-in-Itself. Those same authorities also, in the own respective ways, reached the conclusion that Life(-in-Itself) can only have one motive - namely, to express itself. And since the Principle (Source) of Life has been postulated to be Infinite and Eternal, then it can also be postulated that the expression of Life must be both an Infinite and Eternal progression - in more simpler terms, there is NO LIMIT to the possibilities for expression which are contained in Life, and which may be expressed - even if at our present stage of existence, we may not be able to comprehend some of those possibilities. She often brings but one to bear,"
But it must be clear that this is not all that there is to the matter. As stated before, Life contains an infinite number of as-yet unrevealed possibilities and potentialities, but these will not be revealed, through the working of generic tendencies, i.e., conditions for the operation of the Principle of Life, which have been spontaneously provided by Nature. Rather, these can only be, so-to-say, brought into action, through what might be called a specialized working of the Principle of Life, i.e., said Principle working under special conditions, which are not spontaneously provided by Nature. From the previous discussion involving "Thought Power", the concept of the Macrocosm and the Microcosm was first introduced. In relation to that concept, Universal Mind, being the Original Creative Power, may be said to be the chief agency responsible for the creation and sustaining of the Macrocosm, or entire Universe. The Microcosm may be considered to be the particular world of any single individual entity, and said particular world may be considered the compliment of the Macrocosm. But, by virtue of it being the Original Creative Power, which not only created the Macrocosm, but also sustains it, Universal Mind, by itself, cannot simultaneously operate in the particular world of any individual. For it to do so, it would have to cease being the Original Creative Power, and without the existence of such a Power, things would inevitably cease to be. 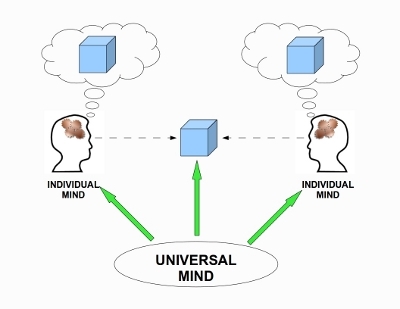 Fortunately, it has been postulated by many of those authorities referred to previously, that Universal Mind may operate in the particular world of an individual, by, so-to-say, operating through the individual, who is the central entity of his or her individual or particular world. 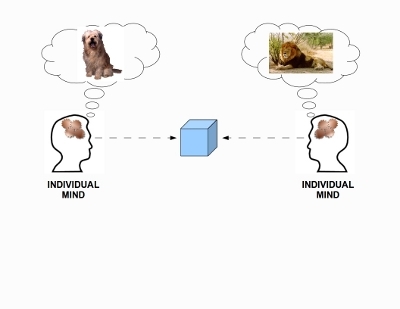 And, as mentioned in the discussion on "Mind Power", Universal Mind does this by becoming Individualized, i.e., creating a miniature reproduction of itself, in the particular world of the individual. Universal Mind therefore may be said to constitute a "template" for the formation and operation of the Individual Mind. 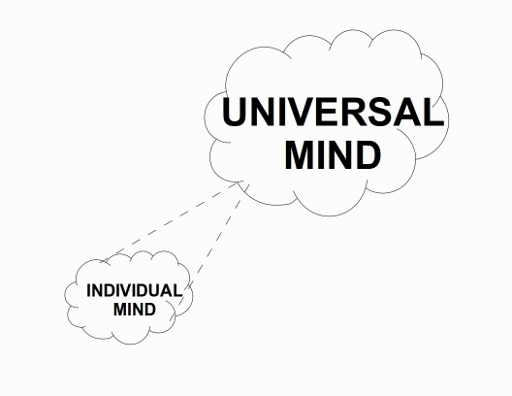 It should be emphasized (and it will likely be re-iterated in the discussion on the Human Mind) that the Individualization of the Universal Mind does not imply breaking off a portion of the Universal Mind to establish an Individual Mind. Rather, it may be taken that, for all practical purposes, the Individual Mind perpetually remains connected to the Universal Mind. Just as a bucket of seawater, collected from a particular location of the ocean, remains a part of that body of water, and demonstrates the same chemical composition, saline level, etc., so the Individual Mind retains and demonstrates the powers, properties and qualities that exist - or rather, subsist - in the Universal Mind. And here we meet with something very interesting, and (as we may discover later on) very significant in respect of the relation that exists between Universal Mind and the Individual Mind. And the factor which is presently under scrutiny is that attribute known as, Personality. Now, Personality has, as but one of its many definitions: the quality of being a person; existence as a self-conscious human being; personal identity. It is also worth noting that "personal identity" also implies uniqueness or individuality, i.e., the particular character, or aggregate of qualities, that distinguishes one person or thing from others. And without going into myriad details of psychology and kindred studies, this can be observed as existing in so-called "real" life. But Personality or Individuality both imply a separation between one entity and another. And, if the Universal Mind itself displayed Personality, or Individuality, then it would be distinguished from some one or something outside of itself. In which case, it could no longer be considered as Universal, because being Universal or Infinite implies encompassing all that is. Therefore, it can be reasoned out that Universal Mind itself cannot display any quality of personal identity which would constitute Individuality. However, by virtue of the observation that each and every human being - which one might recall, may be considered an Individualization of the Universal Mind - displays a particular Personality or Individuality, which distinguishes one person from another, it can also be reasoned that Universal Mind contains within itself, the elements that may be said to constitute Personality, without those elements combining to form any distinct individual identity. Universal Mind may therefore be said to be impersonal, i.e., devoid of individual personality. And, as will be covered in more detail within another section, it is this quality of impersonality that is one of the key factors which lie at the back of any conscious use of Thought or Mental Action, as a creative agency. Now, the conclusion that Universal Mind may be considered a template for the Individual Mind may also serve to address a curious query that has often arisen in the realm of philosophy - namely, whether or not matter, as it registers on our physical senses, actually exists. As strange as it may seem, there have been theories (some may still be held even today) which argue that physical matter does not really exist, but rather is an illusion, which is, so-to-say, "projected" by our individual minds. Some even go so far as to postulate that the illusion is, so-to-say, so all-encompassing, that our five physical senses treat the illusion as reality. On the basis of that theory being actually true, then no two persons should ever register the existence of the same object, at the same time, and in the same place. As a simple example, two people might look at the same physical object, but, in accordance with that theory, the image that registers in their separate minds would be totally different. While it may not be the place of this author to tell anyone else what to believe, there is at least one simple fact that renders that argument effectively null and void. If the proposition that matter is an illusion projected by Man's mind was actually true, then it does not explain how it is that, speaking generally, every person in the same vicinity of any particular object all see, hear, smell, taste or touch the same thing at the same time. A simple example is the fact that generations of people have observed such marvels of the world as the Great Pyramid in Egypt, the Grand Canyon in the United States, London Bridge, and others, and even before the advent of photography, they all described the same object in generally the same manner. In the view of that observation, and unless the proponent decides to introduce a supposition that one person projects his or her illusion of matter into the mind of another, the proposition of matter "being an illusion" simply has no weight. Is it possible to resolve this issue, in a manner that "makes sense". In a word, Yes. The solution is that, just as Matter may be said to be "projected" by Universal Mind, so also the Individual Mind may be said to be "projected" by Universal Mind, which in turn leads to the conclusion that each Individual Mind must, via the action of the physical senses, register the same projection of Matter, at the same time and in the same place. This is in accordance with the simple truth that, where two factors are originated from one common source, the relations between the factors themselves is an absolute fact, in respect of the factors themselves. So it is, that we have before us at least three important propositions that are associated with that Original Creative Power, referred to here as Spirit or Universal Mind - in no specific order, its Infinite and Eternal nature, its acting as a template or model for the formation of the Individual Mind, and, by virtue of both Physical Matter as well as the Individual Mind being creations of it, we have a basis for accepting that Matter is a reality, and not an illusion. There are, of course, other propositions, but in all likelihood, they will be considered in other sections as the inquirer progresses. In addition, the inquirer might be inclined to consider much of what has been stated up to this point to be merely abstract concepts, and he or she might question whether they have any practical bearing in the so-called "real" world. At this point, the only comment that this Author shall make in that regard, is that these and any other "abstract" concepts actually constitute a foundation for any practical application of this information, and that is why they are being put forth at this moment. Just as it would be considered foolhardy, if not dangerous, to construct a building on some area of land without a suitable foundation to support it, it would be equally foolhardy and dangerous to become aware of much of the so-called "deeper" knowledge of this subject, without a foundation to provide adequate support. And that advisory applies equally to this Author, as well as to anyone else.